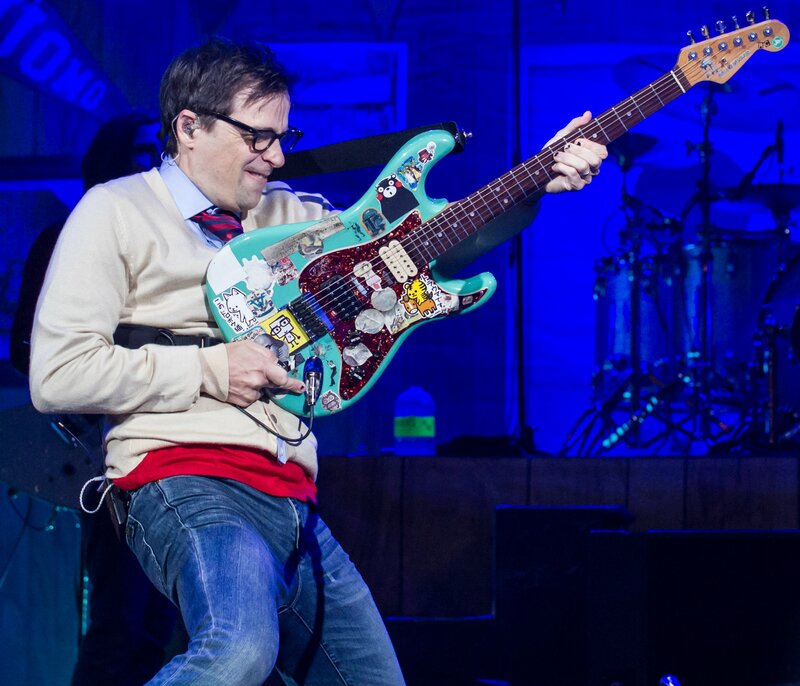 For 25 years running, Weezer has always been the band that made the geeks feel welcome at the party. 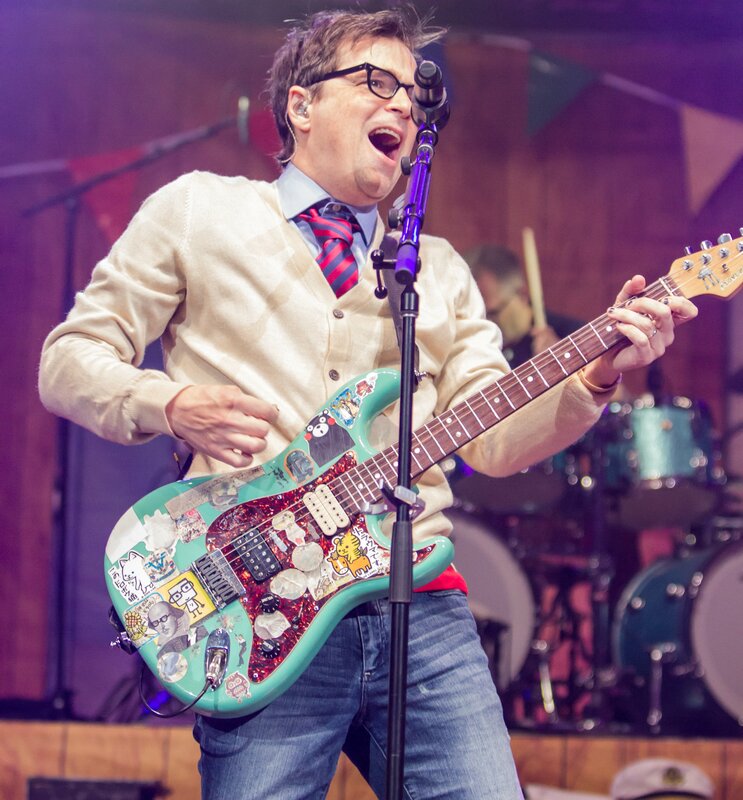 Taking thick glasses and sweater vests out of school cafeterias and onto the stage, Weezer frontman Rivers Cuomo took the crowd on a throwback ride through their past hits, barely touching on their latest release. For those looking for a sense of nostalgia, Weezer’s set on July 11th at Blossom delivered in spades. To open the night, UK-based trio, The Wombats, ripped through a seven-song set that was, to me, way too short. A little biased, as I am a fan, but they left me wanting more. The crowd was equally into their performance, and when they left the stage, everyone went still, probably thinking, “Well, I was kind of loving that.” Fortunately, they wouldn’t be still for long. After a brief stage switch, punk legends, The Pixies, took over crowd-warming duties. They seemed a little out of their element on such a large stage, and their performance overall lacked energy. Never bothering to interact with the crowd, they appeared simply to be phoning it in. It wasn’t a performance I expected out of such a legendary band, but I suppose everyone has their off nights. And, let’s be honest, they probably don’t have to work as hard, as their reputation likely precedes them. When their set was over, I was ready, and everyone around me seemed equally stoked for Cuomo and crew. Weezer seemed ready to give the fans all of their favorite hits in one night, which is really, if you think about it, what bands should do when performing live. Rarely do I find myself wishing a band would play a track that is a rare gem among their hits. Hit after hit rang out, and the crowd did not stop singing each song as loud as they possibly could. Toward the middle of their set, a quick backdrop change led to more of their hits, including “In the Garage” and “My Name is Jonas.” Scootering over to a smaller stage, Cuomo and his acoustic guitar led the crowd through “Island in the Sun” and a shockingly great cover of A-Ha’s “Take on Me.” I don’t think anyone expected it, and everyone I could see was waving their hands and singing. I know some of the kids around me were not born when that one was first released, but music is truly timeless, and the addition of that to their stage show was welcome. Heading back through another handful of songs, it was clear Weezer was giving the crowd everything they wanted. It was definitely an, “I know right where I was when I first heard that song,” kind of night for me. Those nights that help the audience time travel a little bit are always fun. It shows the true transcendental power of music. Speaking of, Weezer seems to revel in that power they know they have, as the crowd eats from the palms of their hands. Making everyone wait until the very end, Cuomo and friends finally broke into their current chart-topper, a cover of Toto’s “Africa.” I am not usually one for covers, but for whatever reason, Weezer covers songs and makes them their own unique brand of cool. And, for the crowd at Blossom that night, it only made sense to leave the crowd sweaty, exhilarated, and full of over two decades of musical goodness all wrapped into one solid night. Devon Anderson mostly writes while under the influence of good old H2O. She is actually a fan of The Pixies, even if this article seems to tell a different story.